1892 Indian head penny value of a well preserved example is over $16. If your coin is one of the few to survive without "problems" it is sought by many collectors. Because of the hazards over long years of service, many of these old pennies show the results of scrapes, bending, dents and lots of wear. An 1892 Indian penny without these distractions is the exception and highly valued by dealers. Rarely does a penny survive today in the condition it left the mint. 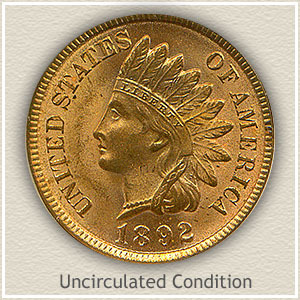 Pictured and desirable as a collectible is an "Uncirculated" 1892 Indian penny, eagerly sought in this condition and valued in the hundreds of dollars. Not only is the coin free from wear but also retains most of the original look and luster of when first minted. Despite having circulated years ago your coin is less common than those of the 1900s placing it solidly as a collectible. Secondly, determine accurately how much your 1892 Indian penny is worth by comparing its condition to the "grading" images below. Availability and condition play large parts in 1892 Indian head penny value. A gem condition example such as the one pictured is not always found in the market place for sale. Patience as a collector is necessary. Remaining in superb condition, as if minted yesterday is difficult for copper coins. All pennies are prone to fading brown, fortunately this piece still radiates original yellow and red mint luster. Easily nicked and marred it also avoided these hazards. A rare coin untouched since 1892. Auctions are where most of these rare coins trade hands. Moving from one high quality collection to another David Lawrence rare coin auction sold this top quality penny for $391. Many collections formed long ago of Indian pennies have the potential of containing high quality examples. 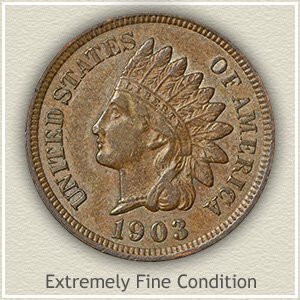 Rarity of condition leads to the highest 1892 Indian head penny value. Rising substantially in value are the 1892 pennies in nice condition. If the headband and "Liberty" within the band are clearly visible there is huge potential for your coin. Also if your coin has avoided heavy nicks, bending and discoloration it adds to value. Review the images and description to get an accurate "grade" of your coin’s condition. Fine: Wear has merged the hairline and headband and continues down the neckline smoothing the ribbon and hair curl where they meet. A positive is the major details of the feathers show and each feather is separated from the next. 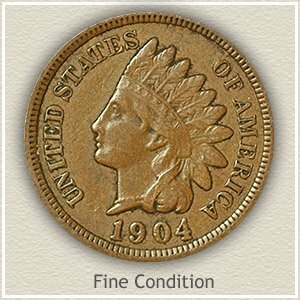 Clearly a coin that has seen moderate wear but your 1892 Indian head penny value is respectable. Common dates are now worth one dollar each. You have a popular coin, everyone understands and has heard of the value of an Indian Head penny. Many collectors are building collections and putting a heavy demand on very rare dates and better condition coins. 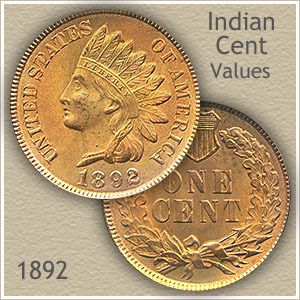 Compare your 1892 Indian head penny value to other dates on the values chart.